Hello, I had such a productive sewing weekend. Since hubby works most weekends, it's the days when I can dedicate some time to sewing. I spent most my time between the two quilts I'm working on. 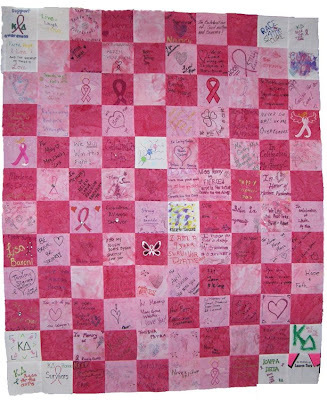 The Lime Quilt and the first of the Breast Cancer Warrior Quilt tops. 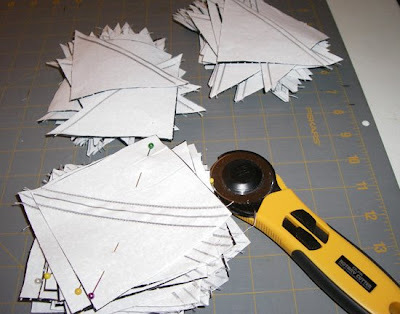 From there, of course it was all that pressing and sizing up the squares and snipping all the edges. Sometimes I forget all the prep-work that goes into making one of these quilts :-). Next thing I knew, several hours went by and I was still just preparing the half square triangle blocks. But, I did finish them all!! yeah!! Here is just one stack. 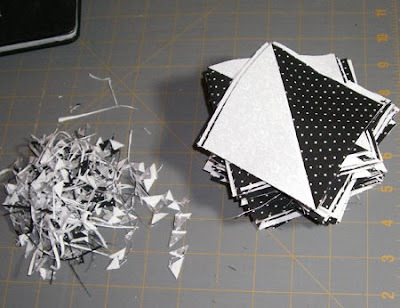 Once these were done, I started assembling more of the quilt blocks. I ended up completing 7 blocks sewn, ironed and trimmed to the 12" size. So, I exceeded my goal of one block per day. With the rest of the blocks, I decided I'm going to create all the rows first and then complete all my ironing in one fail swoop. So, I'm still working on sewing the rows. I was able to complete the first quilt top this weekend as well. Once I started it, I couldn't stop until it was finished. It really is great seeing / reading all the messages. Next step, determining borders and fabric. Only one entry in my book giveaway so an easy winner! So, KarenO if you would email me your address, I'll get the books out to you. Thanks. 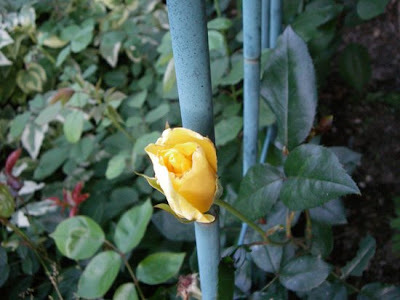 I couldn't help snapping a photo of my first rose bud. It's so tiny. It opened the next day and didn't last long so I'm happy I captured this photo!